The 45mm cutter has more blade exposed than other cutter sizes, letting you cut through more layers of fabric at once. The larger size and weight also gives you more cutting power. Includes removable Cutter Guide, safety guard, textured grip, and can be used left or right handed. 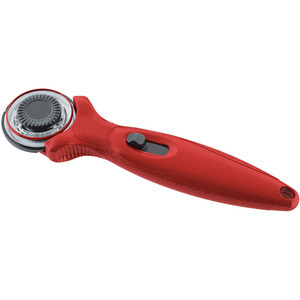 Our StraightCut rotary blade cutter features a more traditional straight style handle with textured side grips, giving you the perfect grip on your cutter. The TrueCut Cutter Guide is also available on the cutters for use with the TrueCut Ruler Track. Cutting through multiple layers of cloth is easier than ever, thanks to the extra blade exposure of the StraightCut Rotary Cutter. Having more blade exposed means that you can cut more layers of fabric. The StraightCut cutter can be set up for right or left-handed use and comes in three popular sizes: 45mm, 28mm, and 60mm. All TrueCut rotary cutters come with the TrueCut Cutter Guide. This guide, combined with the track on our rulers, is what makes it possible to achieve straight, precise cuts every time. As you move the rotary cutter along the ruler's track, the guide keeps the cutter from veering away or slipping off the ruler's edge.